Increase chances of getting back your items when lost or stolen. Stop the sales of lost and stolen items. 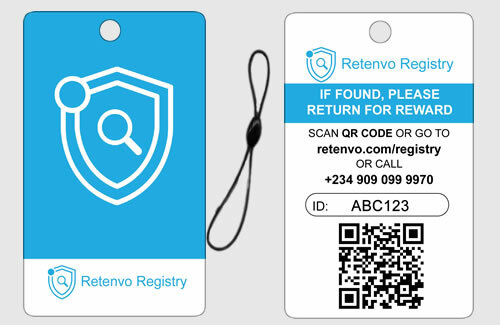 Retenvo Registry help identify, protect and connect lost and found items to their rightful owner, as well as stop the resales of lost and stolen items. Over 70% of people will make an effort to return found property, register and protect your valuable items with a traceable digital identity to increase chances of recovering them in the event they go missing or stolen. Register Your Mobile Phones, Laptops and Cars! Register your Mobile Phone's IMEI, Laptop's Serial Number, Car's Vehicle Identification Number (VIN) and other valuables with unique serial number to prevent their resale if they go missing/stolen. It helps identify the owners of a recovered property with removed or no Retenvo Registry Tag. Get started! Buy a Tag, activate and attach. Or register item serial number. 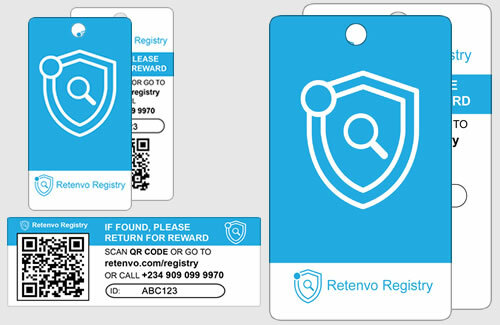 Always on-the-go with your valuables, should you lose your keys, bags, wallet, files, mobile phones, laptops, etc, Retenvo Registry Tags helps identify the rightful owner. 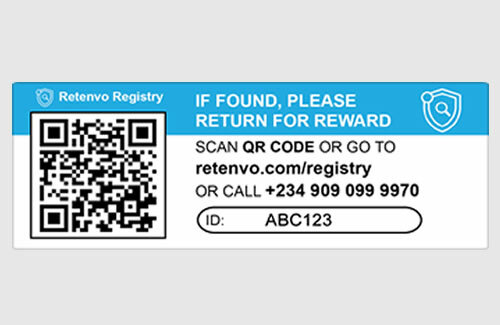 Someone finds the missing item, the Finder reads the Retenvo Registry Tag and report the item online or via our helpline. The item owner receives a notification on how to pickup the found item. We offer sponsored gifts, products and a recognition certificate as rewards to the Finder. We also encourage owners to offer an optional monetary reward to the Finder. Arrange pick up from the Finder and deliver to the owner anywhere across the globe or deliver to respective authorities as per regulations of the country. Owner only pays actual logistics cost. Give your item a traceable digital identity! We simplify securing ownership of your valuables in 2 easy steps ie attaching the tags to your valuables and registering them with us. A unique tag ID protects your valuables anonymously ensuring your private and personal details are always secure and protected from the finder and other users. Once a valuable is reported found worldwide, Retenvo Registry will take actions to ensure that the valuable is returned to the owner in the quickest possible time. Return instructions and Finder Reward Program printed on the Tag increases the probability of the Finder taking the initiative to return. Also help law enforcement agencies verify and reach the owner with ease. Users don't need to worry about battery life of Retenvo Registry Tag because there is non. 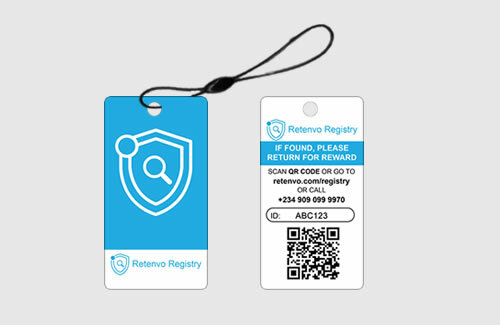 Retenvo Registry Tag is made with quality PVC card and is waterproof, weather proof and manufacture to last years. One (1) smart key tag (28.5mm x 54mm) with unique ID and QR code suitable for car keys, house keys and any keychain. It can fit into any pocket, wallet and similar items. One (1) smart bag & luggage tag (85.5mm x 54mm) with unique ID and QR code suitable for use on all types of bags, luggages, and similar items. Can be attched to pets and animals. One (1) smart stcicker label tag (19.5mm x 50.8mm) for use on mobile phones, laptops, wallet, suitcases, briefcases, file/document folders, int'l passport pack and any electronic gadgets. One (1) piece of each: key tag, bag & luggage tag and sticker label tag. Save over 40 percent.